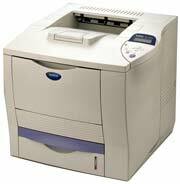 The network-ready HL-7050N is an office workhorse, delivering high-quality monochrome output at up to 30ppm. This printer features up to 1200x1200dpi print quality and a wide variety of industry standard emulations including PCL6, IBM Proprinter XL, Epson FX, HP-GL, and BR-Script 3 (PostScript? 3? language emulation). The HL-705N has low running costs with individual, easy to replace toner cartridge and drum unit. Additional features of the HL-7050N include: a built-in 10/100 BaseT Ethernet print server, PC and Mac compatibility, 32MB of standard memory (upgradeable up to 288MB), and a 600-sheet paper input capacity that can be increased with optional lower paper trays.